It was a brisk, cloudless, January morning, a perfect day to be out and about. I was working in the yard and considering a trip to the Home Depot. At a shopping center a few miles to the south, several dozen people were queuing up outside of a grocery store to speak with their congressional representative. A little girl with an interest in politics had eagerly come along with her neighbor. A federal judge had dropped by to congratulate the congresswoman on her recent re-election. Several folks arrived seeking help dealing with government agencies. A man in a hurry pushed his way through the line and around the folding table where the congresswoman was getting organized with her staff. He pulled out a gun and opened fire, then turned and continued shooting into the crowds gathered nearby. Gripped by a terrible psychosis, he emptied a 30-round clip and stopped to reload. A wounded woman batted the second clip out of his hand, giving others the moment they needed to tackle and hold him until the police could arrive. The gunman had managed to shoot 19 people, killing 6. 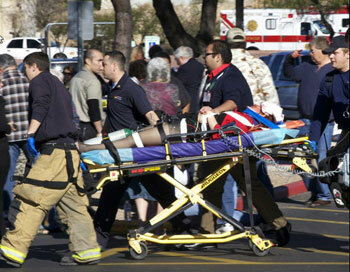 He gravely wounded Congresswoman Gabrielle Giffords, intending to kill her, miraculously failing. In his demented anger he wounded and murdered indiscriminately; the dead included a 79-year-old grandmother and the 9-year-old political science enthusiast. Gabrielle Giffords had won a tough re-election battle and was looking forward to another term serving the interests of the Democratic party and her southern Arizona constituents. She loved meeting with people, listening to their concerns, and doing what she could to solve their problems. She loved politics, and seemed destined for a long and successful career in Washington, D.C.
Today, the once fluent public speaker finds conversation difficult. The bullet went through the left side of her brain, shattering the speech processing areas. She is having to learn from scratch how to verbalize her thoughts. If she is able to continue her career in public service, and that appears doubtful, she will struggle mightily with the very part of the job that came so easily to her before: interacting with constituents about the issues affecting their lives. A deranged man turned a peaceful community gathering into a scene of horror. Neither the victims nor the authorities had any clue what they would be facing until the bullets started flying, and by then, of course, it was too late. The alleged killer had flown under the radar of anyone who might have helped him until it was too late. Our lives take the most unpredictable twists and turns. We lull ourselves into believing that we have everything figured out, everything under control — and then we’re blindsided by something we never saw coming. It’s the sort of statement that might sound arrogant, even insane, coming from anyone else. Perhaps it really does sound a bit insane as you read these words, especially if you’ve recently had your life turned upside down by some unexpected tragedy or grief. At such times, Jesus claims to be able to restore our peace. At such times, Jesus claims to be the very source of the peace we desperately long for and need. He never promises to keep sorrows and troubles away from our doors, but he assures us that we can find peace, in him. Today, Tucson will remember that awful day with the ringing of bells at 10:11am, the moment the first shots rang out one year ago. A community deeply hurt struggles to find peace, and to find appropriate ways of honoring the dead, the wounded, and the multitudes who are still grieving. We’ve gathered for speeches, for memorial services, for hikes, and soon the city will erupt in the sound of bells. Where does peace come from at such times? When life turns upside down, may we remember the life and words of the Prince of Peace and experience the reality of his presence, his comfort, and his peace.